Dancing Man is Getting the Word Out! Dancing Man is now up and blowing all over the place to tell people something special is going on this weekend! 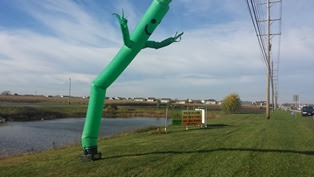 Once drivers see the dancing man hopefully their attention will be drawn to our Trunk or Treat banners. Please pray with me that a year from now there would be people who have been transformed by Jesus Christ because of this first experience of fun at our family’s home. 1. Pray – Ask God to bring many families so the gospel seed might be planted in their hearts. 2. Bring Candy!!! – We need 25,000 pieces of candy! We are looking for fun size candy. We would appreciate every family bringing one or more bags of candy this Sunday or dropping it off at the office this week. 3. Invite Families – This is the most enjoyable part of evangelism. Building relationships and having fun together. This will be your easiest ask of the year – kids love candy and fun events! It will give people you know opportunities to visit our campus and realize that church can be a lot of fun. Invite someone today and have your kids invite their friends. You can pick up more Trunk or Treat invites at the office this week. 4. Volunteer – We have more than 80 people that have signed up so far. We still need some more people to be guides to usher people thru the maze of events. Anticipating God’s work this Sunday!